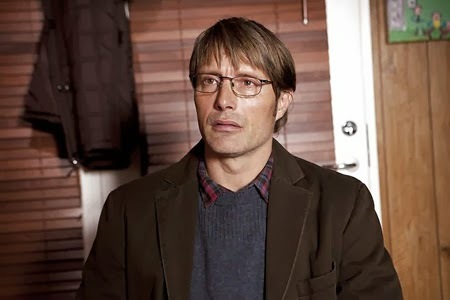 Lucas (Mads Mikkelsen) is 42 years old, divorced with a teenage son, and a kindergarten teacher at a small school in rural Denmark. As the film opens, he is forging a friendship with a young student, Klara (Annika Wedderkopp), whose father (Thomas Bo Larsen) is her best friend. Her home is slightly combustible and she seems content to withdraw into herself, to stand on the periphery and watch, and Lucas, it seems, is the only one able to make delicate inroads to her personality. It would be sweet if the opening scenes, a deer hunt, shots fired, blood drawn, did not provide such ominous overtones. No, this relationship and this movie will not be sweet. With the most innocent of crushes, Klara kisses Lucas on the lips. He politely scolds her, and she is emotionally hurt. This combined with her overtaxed imagination combined with her brother accidentally subjecting her to images not age appropriate all roll up into Klara re-withdrawing and making a comment to the schoolmaster that initiates a terrible trajectory. That is, Lucas is accused of molesting of Klara. Which leads to accusations of him molesting other children at the school. Which leads to Lucas’s life being turned upside down in an instant and the town itself instantly and forcefully turning against him. That the audience is never made to doubt what did and did not happen, it is never in the dark about Lucas’s true innocence. But then true innocence is not related to the film’s true point. This is not the story of a wrongly accused man fighting for justice. Little to no interest is paid to the legal aspects of the situation. The school continually reminds the frightened parents that they have passed the matter on to the police, but no police are really seen. Detectives are apparently taking statements from other children and their parents, but these detectives and statements are not shown. Lucas is arrested and taken to jail, but we never see him interrogated, never see him meet with a lawyer. Lucas goes before a judge, but this scene takes place off screen. No, the only investigators and judges in “The Hunt” are Lucas’s fellow townsfolk. The only interrogation the film shows is the schoolmaster’s friend, summoned because he “knows about these things”, ever so sweetly asking Klara the most leading questions imaginable. The schoolmaster seems to have made up her mind and the interviewer seems to have made up his mind, and because they have made up their minds, everyone in town has made up their minds. Lucas is a sinner and a sexual predator. Open and shut, no follow up questions asked. He cannot even enter his local grocery store without being verbally and physically assaulted. His son comes to his defense and finds himself shunned too. Ultimately “The Hunt” is gut-punching commentary on society’s frightening rush to judge, to prosecute in the court of public opinion without hearing all the pertinent facts, to render the world in the sharpest of black and white. At the risk of sounding crass, I kept envisioning Danish CNN, reporting outside Lucas’s house, talking to “eye witnesses” who actually had not seen anything, influencing the whole public sphere to lean in one direction. And because he is considered a predator, justly or unjustly, everyone else’s terrifying predatory nature therefore is permitted. Throw a brick through his window? Go ahead! We "know" what he did! Pelt him with frozen meat? Sure! He's "guilty" as sin! This is a common scenario in our current world, one that demands introspection, I think, to correct, but introspection is difficult to come by in a world in hyperdrive. What gets lost, purposely, as the horror progresses is Klara. As the film opens, she seems troubled. Once she makes her accusation, however, those troubles are forgotten and the new trouble – which isn’t even real – emerges. Of course, it’s difficult for parents and administrators to ascertain precise truth when an impressionable child is at the center, but the failure to perform due diligence and ask her real questions not only sends Lucas into a spiral but threatens the well-being of Klara too. The final scenes harken back to the beginning scenes - Klara still standing alone on the periphery, only Lucas coming to her aid, and a hunt that ends in an oblique silohouette. Judgement has long since been thrown down. Life will not just go on ever again. Gut-punching is exactly what I called it too. It will make it way up on my top 10 list of 2013. It's definitely in the top 5.